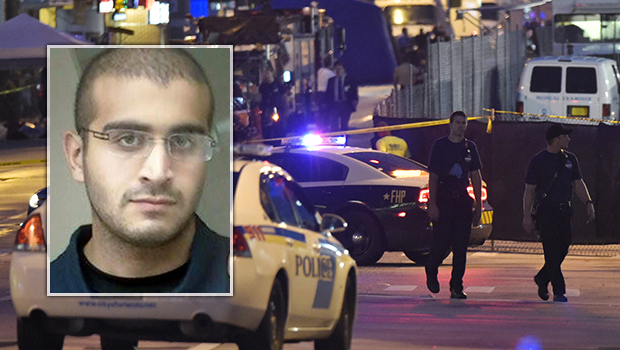 ORLANDO, Fla. -- Gunman Omar Mateen entered the Pulse nightclub at least once before he returned to begin the Orlando shooting, investigators told CBS News on Tuesday. CBS News Justice and Homeland Security correspondent Jeff Pegues reported Mateen went into the club and received a wristband, according to law enforcement sources. Mateen left at some point and returned about 2 hours later to begin the attack that left 49 people dead and 53 wounded early on the morning of June 12. After a request for $5 million in FEMA emergency disaster funding by Gov. Rick Scott was denied earlier Tuesday, Attorney General Loretta Lynch said while visiting Orlando that the Department of Justice was prepared to financially support both families and the local government to some degree. "The Department of Justice is making $1 million in emergency funding available to the Florida Department of Law Enforcement," Lynch said. "The state will be able to apply for funds on behalf of Orlando and other affected jurisdictions to cover overtime costs for state and local responders." The DOJ is also providing counseling to first responders from the Orlando massacre, Lynch said, "because in their bravery, they shoulder the dangers visited upon us and carry that weight long after the smoke has cleared." As for victims and their families, Lynch said the DOJ had partnered with local officials to set up "a Family Assistance Center." There, those affected by the Orlando shooting can find counseling, post-disaster planning assistance, and other support. Additionally, Lynch promised to make "federal emergency funds and victim compensation funding available to cover family travel expenses, medical and mental health expenses and other costs related to the tragedy." After what she called a "very difficult meeting" with victims' relatives, Lynch directly addressed the LGBT community, saying, "We stand with you to say that the good in the world far outweighs the evil ... and that our most effective response to terror and hatred is compassion, unity and love." A Florida man has come forward claiming he notified the FBI about Mateen in 2014. "Most of our conversations were religious based, but nothing radical or homophobic or hate-related," Mohammad Malik said. Malik attended the same mosque in Fort Pierce as both Mateen and Moner Mohammad Abu-Salha, who became the first known American suicide bomber in Syria. Shortly after Abu-Salha launched his attack in May 2014, Malik heard Mateen talk about radical Islamic cleric Anwar al-Awlaki's videos. Malik says he then called the FBI. "He told me they were very powerful," he recalled. "That raised the red flag even higher for me." The FBI did investigate Mateen -- for the second time in two years -- and cleared him of any suspicion. Malik says the FBI never asked about Mateen again, but did contact him about the Muslim community. "These people that have committed these acts have radicalized on their own -- not through the mosque," Malik said. He says the connection between Mateen and Abu-Salha was nothing more than a coincidence. Meanwhile, the company Mateen worked for as a security guard is being investigated by the state of Florida over a problem with his firearms license. The psychologist listed on a notarized license application as having evaluated Mateen's mental competency told CBS News she never saw him. In fact, Dr. Carol Nudelman said she had moved her practice a year before the September 2007 date the form claims he passed the exam. GS4 claimed Tuesday the discrepancy was an "administrative error" and that the Headquarters for Psychological Evaluation actually performed Mateen's evaluation. "The Florida Division of Licensing is investigating the administrative error relating to Mateen's license application," a company spokesperson told CBS News in a statement. "G4S is cooperating fully." Messages left by CBS News for that company and its owner have not been returned. The largest security company in the world, GS4 provides security at 90 percent of U.S. nuclear facilities, in addition to the State Department, Homeland Security and the Department of Defense. Companies named GS4 received more than $1.6 billion in U.S. taxpayer money between 2008 and 2016, according to records from USASpending.gov. According to a transcript released Monday of the 911 calls he made during the massacre, Mateen pledged allegiance to the leader of ISIS, telling the police dispatcher, "I did the shootings." "I pledge allegiance to Abu Bakr al-Baghdadi, may God protect him," Mateen said in Arabic, "on behalf of the Islamic State." The Justice Department and the Federal Bureau of Investigation had previously released a version of the transcript that omitted the pledge of allegiance to ISIS. Lynch said in a statement Monday that the decision to redact the transcript was to remain "sensitive to the interests of the surviving victims, their families and the integrity of the ongoing investigation." Mateen spoke to law enforcement four times from the club during the attack, including three calls with the Orlando Police Department's Crisis Negotiation Team, the FBI said. Those calls lasted nine minutes, 16 minutes and three minutes respectively. CBS News senior investigative producer Pat Milton reported that a law enforcement source confirms authorities have a video of Mateen practicing with the assault rifle he used in the attack. The video is apparently from a Florida shooting range where he purchased the rifle in early June. Additionally, ISIS released a videotape Monday praising Mateen, CBS News' Khaled Wassef reported. In the videotape, an American-sounding militant calls Mateen "one of the soldiers of the Caliphate," and calls him "one of the few who was truthful to his lord." Officials have repeatedly shot down any suggestions there was a direct link between ISIS and Mateen, stating that he was a "lone wolf" inspired by their online propaganda. Orlando officials have refused to provide hundreds of 911 calls made by victims and witnesses during the shooting to a coalition of news organizations, citing confidentiality under Florida law, and arguing that an ongoing investigation kept the tapes secret. Ronald Hopper, FBI assistant special agent in charge in Orlando, said Monday that the tapes would not be released out of respect for the victims. Mateen told negotiators he was "an Islamic soldier," and that he was demanding America "stop bombing Syria and Iraq," giving that as the reason he was "out here right now." According to the FBI: "When the crisis negotiator asked the shooter what he had done, the shooter stated, 'No, you already know what I did.'" Mateen told police he had placed a bomb in a car outside the club. "You people are gonna get it, and I'm gonna ignite it if they try to do anything stupid," Mateen said. Later in the call with the crisis negotiator, the shooter stated he had a vest like they "used in France," likely in reference to the suicide bomb vests several of the killers in the Paris attacks possessed. Mateen also threatened more similar style attacks "in the next few days." After this, the shooter hung up and did not answer his phone anymore. At 4:21 a.m., police pulled an A/C unit out of the wall and began evacuating victims. Eight minutes later, victims began telling police he was planning on putting suicide vests on four victims inside the club. At 5:02 a.m., the SWAT team breached the bathroom wall at Pulse to free hostages and engage the shooter. Thirteen minutes later, he was reported dead. The FBI says that during the three hours between the initial gun battle with cops and the final showdown with SWAT, there were no reports of shots fired in the club, and that officials were going in and out rescuing people.